I’ve always enjoyed poring over a good map. Whether it’s thumbing through a road atlas, spinning around a globe, or sticking pushpins into a wall map to designate where I’ve been and where I want to go, I can find countless ways to amuse myself with a well-designed map. So if there’s an app that can bring that experience to the iPad and tell me a little more about the world around me, I’m eager to give it a try. National Geographic Society offers a pair of iPad-optimized atlas apps—World Atlas HD and The World by National Geographic. Both apps deliver the world to your tablet, with an easy-to-control interface and a decent amount of data. Unfortunately, neither app taps into the full capabilities of iOS and both left me wanting more. Going Global: World Atlas HD features a global view that you can spin and rotate with the touch of a finger. 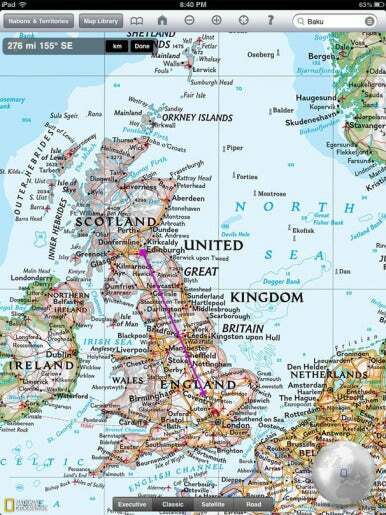 Zooming in on a particular country is as simple as tapping or pinching. 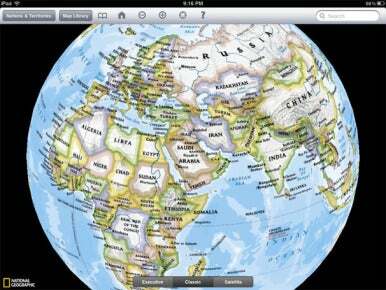 Let’s start with World Atlas HD, a mainstay in the top download charts on the App Store. Launch World Atlas HD, and it’s easy to see why: The app opens to a gorgeously rendered globe, either in portrait or landscape view, that you can spin and rotate with just the touch of a finger. You’ve got a choice of three looks—the sepia-hued Executive view, a brighter Classic look, and Satellite. The controls will be familiar to anyone who’s used an iOS device: Double-tap or pinch outward to zoom in, or pinch inward to zoom out. Move your finger in any direction to scroll to new part of the map. It’s a big, wide world out there, and World Atlas has opted to keep the size of the app to a manageable 67.6MB by only preloading a few levels of maps. In other words, if you’re connected to a network via Wi-Fi or a cellular connection, you can zoom in to your heart’s content, right down to road maps supplied by Bing. But if you’re offline, you can only tap a few times before you hit a blank screen. Instead, World Atlas HD encourages you to download maps for offline use. (Even if you download maps, you can still only use Bing’s road and satellite views when you have an Internet connection.) It’s a clever idea for keeping file sizes to a manageable level, but it isn’t smoothly implemented. World Atlas divides its map library among six continents, with different maps for both the Classic and Executive views. It can be hard to remember which map and which view you’ve downloaded. I would also prefer a simple alert when I’m trying to zoom in on a map I haven’t downloaded; that seems like a better approach than showing me a grayed-out screen that I have to zoom out of to resume using the app. How Far Must We Go: Tap and hold on the distance scale bar in World Atlas HD, and it becomes an adjustable direction line that shows the distance between two points on the map. World Atlas HD lets you drop pins on the map, but only for your current location and in the capital cities of countries around the globe. Tapping and holding to place a pin as you would in the built-in Maps app doesn’t work here; instead, that behavior summons a pop-up window containing information about the country you’re tapping on. The information is certainly useful and adds value to World Atlas HD, but if you like to put pins on all the cities you’ve visited or the places you’d like to go to, you’ll likely be disappointed with this app. There is an especially clever feature in World Atlas HD involving the distance scale bar in the app’s upper left corner. If you tap and hold the scale bar, it becomes a purple direction line that you can drag anywhere on the map. You’re able to adjust the start and end points, which gives you a good idea of the exact distance between two points on the globe. I’m less impressed with the way World Atlas HD handles search. You can start typing the name of a city or country in the search box, and the app will dynamically generate a list of results. Tapping one of those results will make the app jump over to that city or country—but the search results box and on-screen keyboard remain. It takes a separate tap to dismiss each and get a full view of the result you wanted to see. That feels kind of sloppy to me. 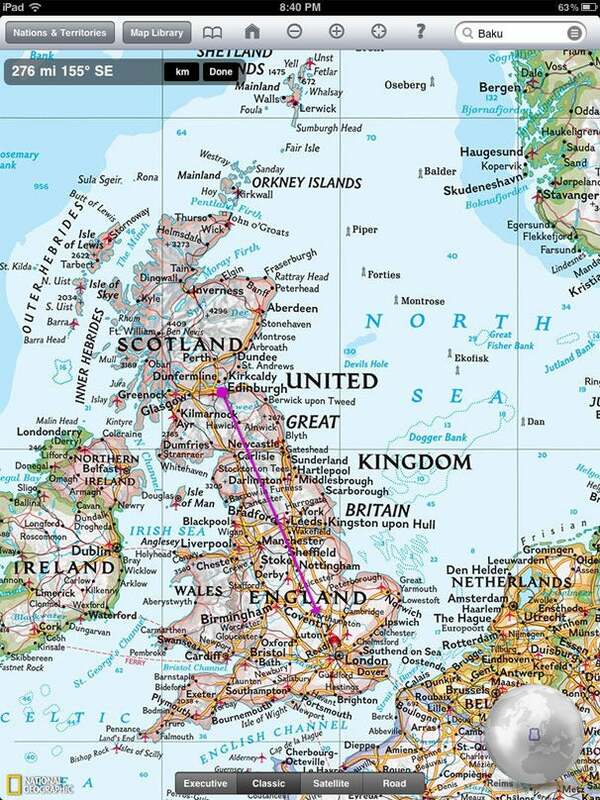 Panning around the globe is fairly smooth, but zooming in and zooming out causes the app to redraw your view. The redrawing happens fairly quickly, even on an original iPad, though some users might expect a more seamless experience. Note that if you’re zoomed in on the Pacific Ocean, you can’t pan past the International Date Line; the app will force you to zoom out to the globe view in order to enjoy uninterrupted panning. 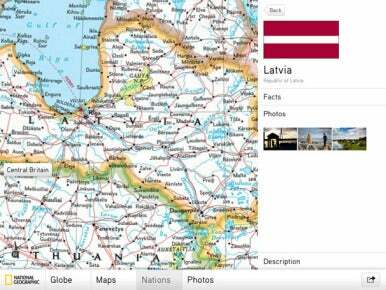 World Atlas HD isn’t a bad app by any stretch of the imagination. But two years after the iPad’s debut, the app doesn’t feel like it’s taking full advantage of what iOS and the iPad have to offer. Certainly, better search and bookmarking features would go a long way to refreshing this app. The World also includes the nation factboxes found in World Atlas HD, but puts its own twist on the feature. Call up information on Belize, for example, and The World lists population, language, GDP, and other data; it also includes a brief description of the country. But there’s a photos tab as well, offering National Geographic images. World View: In addition to facts and figures about a particular nation, factboxes in The World by National Geographic include full-screen photos shot highlighting the country you're researching. The photos look great on the iPad’s screen, but again, there’s something of a missed opportunity here. If I’m looking at the photo of Mont Blanc that’s included in the France factbox, I’d like to see some indication on the attached map of where that photo was taken. The World doesn’t do that, and while it certainly isn’t a deal-breaker for the app, it’s one of those things that would have made The World so much more valuable to users. That complaint aside, The World by National Geographic is a decent mobile atlas, if not a standout one. Students interested in geography—and anyone looking for a different view of the world—will find some value in National Geographic’s offering.